Saint Augustine (354-430) is one of the most influential thinkers of the Western World. His answers to life’s profound questions shaped Western civilization to an unparalleled degree. How did the Middle Ages come to know this great Father of the Church? How did his large oeuvre survive the nearly sixteen centuries since his death? This is the fourth in a series that looks over the shoulder of medieval readers to discover how they shaped Augustine’s legacy, and created an image of the man that has endured to our times. If summertime conjures up in your mind images of sundrenched Italian countryside and azure blue Mediterranean waters, you are certainly not alone. So, in honor of the sunny summer months and dreams of Italy, our next stop on Augustine’s journey through the Middle Ages is Naples. Many of the African Church Fathers’ writings found a haven in Southern Italy after the Vandal invasion and that was also true for Augustine. Around the year 492, a monastery was founded in the Bay of Naples on the island of Megaride. This tiny speck of land was the site where Greek colonists from Cumae first settled. In the first century BC a magnificent Roman villa was built there by Lucius Licinius Lucullus (118-57/56 BC), a Roman consul and successful general. His name long remained attached to the complex: after it was fortified in the fifth century AD, it was known as the Castellum Lucullanum. One of its most famous residents was Romulus Augustulus, the last emperor of the Western Roman empire before it collapsed. He was exiled there after his deposition in 476. 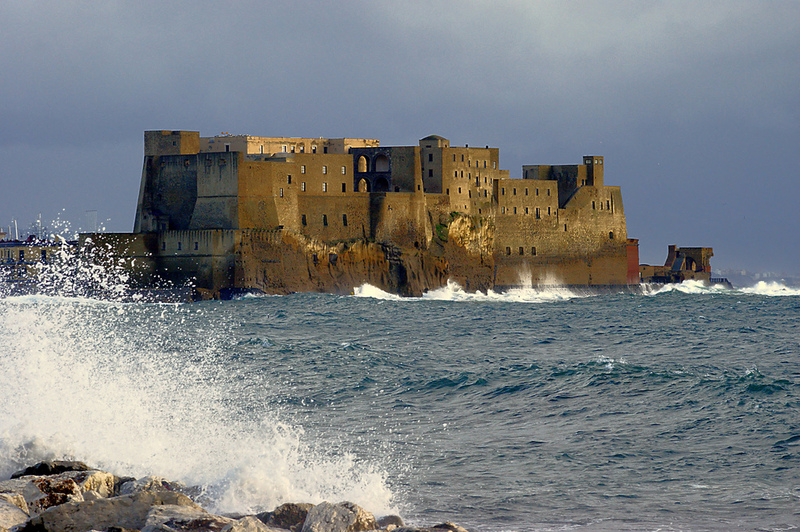 Incidentally, today the fortification is called Castel dell’Ovo or ‘Egg Castle’. This unusual appellation refers to a legend that the Roman poet Virgil put a magical egg in the foundations of the castle. If it had broken, the structure would have collapsed, which would have spelled disaster for the city of Naples. If you are wondering why a poet would have magical eggs in his possession, that all has to do with Virgil’s Fourth Eclogue. Written around 42 BC, the poem speaks of the birth of a savior who will rule the world. In the Middle Ages, this poem inspired Virgil’s reputation as a prophet who had accurately predicted the birth of Christ, and from there he became a diviner and a magician. Near the end of the fifth century, with the blessing of bishop Victor of Naples, the castle became a monastery. One of the monks who settled at Castellum Lucullanum and eventually became abbot of the community was Eugippius (ca. 460-ca. 540). His contribution to Augustine’s afterlife was such that calling him a mere ‘reader’ of Augustine would be an injustice. Rather, I would label him one of Augustine’s first editors, publishers, and publicists, because, just like a modern editor, Eugippius did three things to make his author a success. Eugippius was among the first who condensed Augustine’s massive oeuvre into a more manageable whole, though ‘manageable’ is certainly a relative term: his Excerpts from the works of saint Augustine comprise over 1000 pages in the printed edition of 1885. The anthology consists of some 350 extracts selected from about 40 Augustinian works. Eugippius had to go beyond his own library in Naples, to Rome, to find such a wealth of source materials, and also borrowed material from friends and acquaintances while preparing the work. In his dedicatory letter he states his purpose in creating the collection: to make available texts that were dispersed and difficult to access, in a single volume. He appears to offer a guide to the Christian life rather than an exhaustive presentation of Augustine’s thinking. It has been argued that Eugippius created with his Excerpta a bland version of Augustine, free of controversial opinions and unique theological views, palatable to all and more easily digested than the original. We probably still don’t understand his magisterial excerpt collection well enough to make such a claim, but, for better or worse, it is one of the most influential guides to Augustine’s oeuvre ever produced. Eugippius included in his excerpt collection fourteen extracts from a work Augustine composed On the literal meaning of Genesis. Eugippius took this work of twelve books and divided each book into chapters, giving each of them a chapter heading. He also added notes, comments and short summaries of the contents in the margin, all of his editorial activity with the purpose of making the work more easily accessible and searchable. From his working exemplar of Augustine’s commentary on Genesis, Eugippius had a ‘clean’ copy made with his numbered chapter titles appearing at the beginning of each book, serving as an index or table of contents. This organization of the work and Eugippius’ marginal annotations survive in multiple manuscripts, constituting the so-called ‘Eugippian recension’ in the manuscript tradition of On the literal meaning of Genesis. Eugippius corresponded with many leading figures of his day both in politics and the Church and moved in the highest social circles. He had what a slightly nostalgic person would call ‘a solid gold rolodex’. The dedicatee of Eugippius’ Augustinian anthology provides the perfect illustration. The work was offered to Proba, daughter of Symmachus and member of one of the most powerful families of the ‘old’ Roman aristocracy, herself a consecrated virgin and patron of Christian authors. It probably didn’t hurt Eugippius’ popularity that Castellum Lucullanum boasted a rich library (likely containing remnants of Lucullus’ personal collection) and an active scriptorium which could provide copies of much-desired manuscripts to Eugippius’ acquaintances across the Mediterranean. We preserve today three sixth-century codices issued from the scriptorium and several younger copies of manuscripts created under Eugippius’ supervision. The most famous of the latter category are the Echternach Gospels (Paris Bibl. Nat. lat. 9389) whose model contained a note that it had been corrected ‘according to a codex from the library of Eugippius’ in the year 558. Ensconced in a web of powerful correspondents and with an excellent reputation as an author and a scholar, Eugippius’ endorsement of Augustine was heard and heeded by many. Next month’s column continues the theme of popular vacationing spots. We travel to the South of France, where a conscientious bishop collected Augustine’s sermons for uninspired preachers in his diocese. Jérémy Delmulle & Warren Pezé, ‘Un manuscript de travail d’Eugippe: le ms. Città del Vaticano, BAV, Pal. Lat. 210’, Sacris Erudiri 55 (2016), 195-258. Shari Boodts is a postdoctoral fellow at the Catholic University of Leuven in Belgium. You can learn more about Shari at her website or Academia.edu page.